A Sambal is a chilli based sauce which is normally used as a condiment. 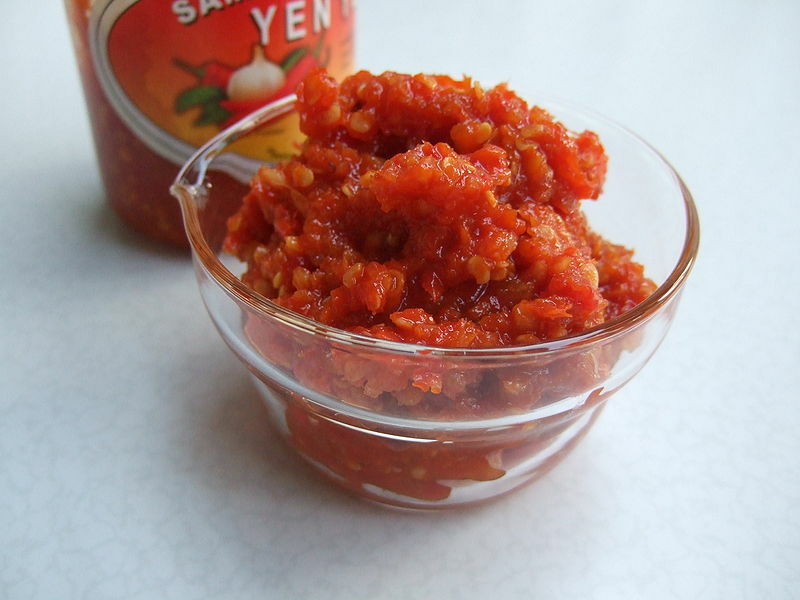 Sambals are popular in Indonesia, Malaysia, Singapore, the southern Philippines and Sri Lanka, as well as in the Netherlands and in Suriname through Indonesian influence. It is typically made from a variety of peppers, although chili peppers are the most common. It is sometimes a substitute for fresh chilis. It can be extremely spicy for the uninitiated. Some ready-made sambals are available at exotic food markets or gourmet departments in supermarkets in many countries. Sambal lengkong (with ikan parang/wolf herring). 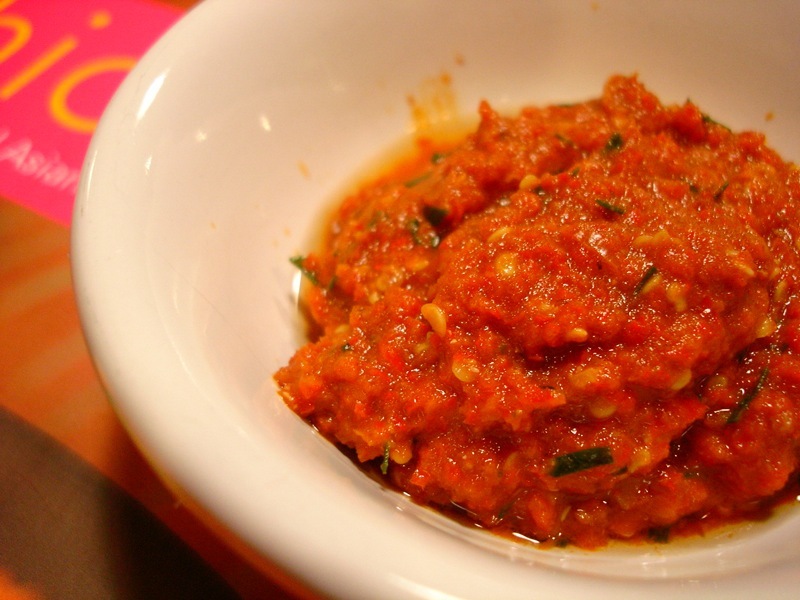 One of the most common Indonesian styles of sambal is Sambal Terasi. Similar to the Malaysian Belacan (see below), but with a stronger flavor since terasi is a more condensed shrimp paste than belacan. Red and green peppers, trassi, sugar, salt, lemon or lime juice (tangy, strong). One version omits the lime juice and has the sambal fried with pounded tomatoes. Popularly eaten raw. One of the most common Malay style sambal is Sambal Belacan. A Malay Fresh chilis are pounded together with toasted shrimp paste (belacan) in a stone mortar to which sugar and lime juice are added. Tomatoes are optional ingredients. Left: Sambal Belacan made with mixed toasted belacan (shrimp paste), ground chili, kaffir leaves, sugar and water. Sometimes, sweet sour mangoes or equivalent local fruits are also used. It can be eaten with cucumbers or 'ulam' (leafy herbs) in a meal of rice and other dishes.